We just got some 10-15cm of fresh snow here in Finland so I’ll continue with winterish topics. I was writing another monster post but decided to split it in two. This post has some information and my opinions about snow shelter in general . The second half will include detailed descriptions on how I have built quenzees and snow caves. It is warm, silent and cozy inside a snow shelter. This picture is taken inside a snow cave built March 2011. As with many other skills, practise makes perfect and luckily building snow shelters is very fun. There is no reason for not to build one if you have the chance. 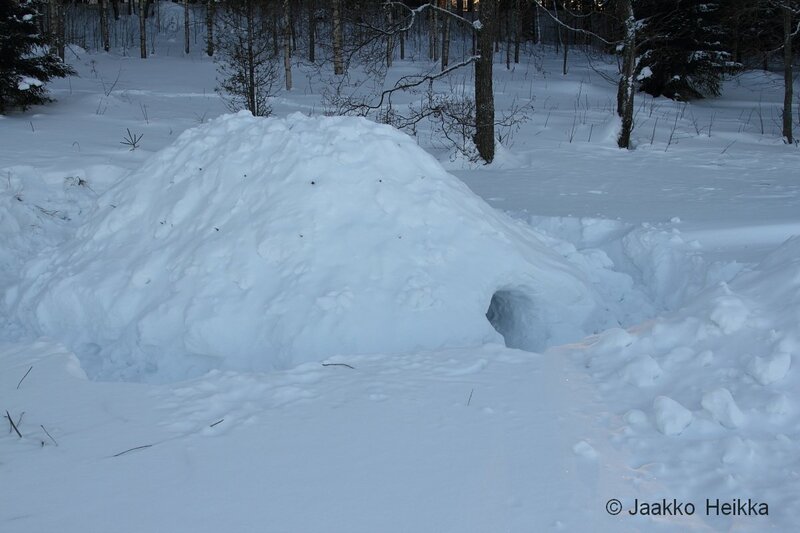 It is still full winter in Finland so there is time to try a snow shelter. I spent last Saturday night digging a snow cave in a snow bank built by snow blows driving by. All you need is enough snow, shovel or few and preferably waterproof clothing. Ski stick and candle are also useful in the later phases of building. Here is an overview on snow shelters, building equipment and some of my own experiences about them. This post is written with the emergency use in mind but the advice works of course for recreational building. Snow is very good insulator and often the temperature inside a good snow shelter is around 0 degrees Celsius, despite the freezing temperatures outside.In addition to insulation snow shelter should protect you from wind and snowdrift. And it also unbelievably quiet inside the snow. Usually, the smaller the shelter the warmer it is and naturally smaller shelter is quicker to build. But it is good to bear in mind that if you build the shelter for emergency use, you might have to spent a long time in it so it is good idea to build it well at once. Cramped and inadequate snow shelters have led to lost lives in prolonged storms. There should be enough room for at least all to sleep in their sleeping bags in comfortable position and maybe room to sit and use stove to melt snow. The other option to get water would be to melt snow in bottle in sleeping bag with your own body warmth. It works if you have enough food to keep your body warm but is not that comfortable. It is good idea to always have a candle burning inside your snow shelter to measure the oxygen level. While you breath your body turns oxygen into carbon dioxide and if the shelter has inadequate ventilation, carbon dioxide level will rise to a dangerous levels, possibly causing even death. Luckily, the oxygen level drops accordingly and a fire needs oxygen to burn. If the candle dies, the oxygen level is too low, but still enough for a human to stay conscious and do something about it. To sum it up: lite a candle, as long as it burns everything is fine. If the candle doesn’t burn properly or dies, add ventilation. 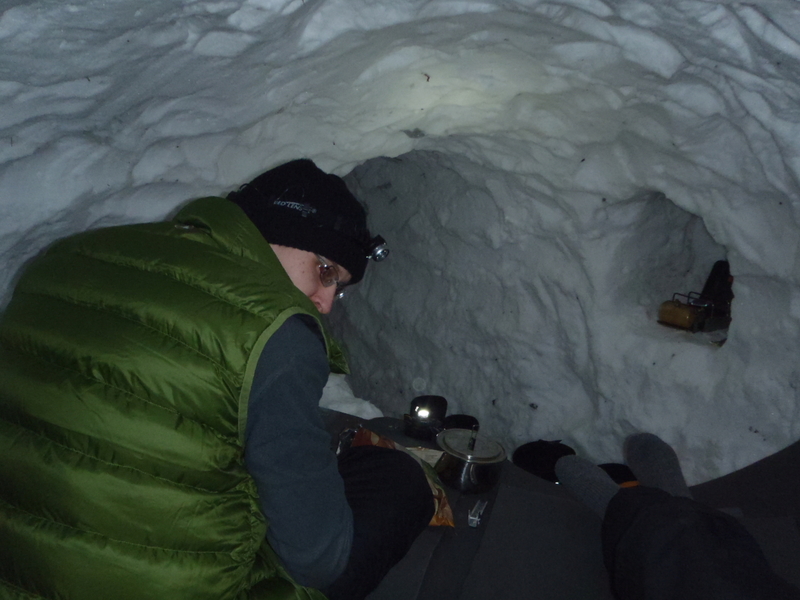 Inside a snow cave in Sarek. The burning candle means that the oxygen level is adequate. It is good to keep in mind that the work required to build a shelter will likely keep you warm but you can also get wet and sweat a lot while working (especially while carving the inside of a quenzee or a snow cave). So preferably wear waterproofs while digging, remember to drink during the process and try to keep some of your clothing dry to be worn when inside. It is often advised to collapse the snow cave or quenzee after use. This might be a good idea on some areas but on most occasions, I have left my snow shelters standing and sometimes returned later to sleep in them. Sometimes it is also advised to mark the snow shelter with crossed skis or with a colorful cloth tied on a ski stick I haven’t done this and I know that properly done snow cave doesn’t collapse even if driven over with a snowmobile. But marking the snow cave might be a good idea, especially in emergency circumstances. Tools used to build a snow cave in really hard snow. The optimal snow shelter depends on conditions and need. In addition different snow shelters require different tools and some are more comfortable than others. If working with soft snow you need a big shovel and if cutting blocks you need a saw but you can also use long bladed knife like the Inuits. A regular wood saw works just as well as a specific snow saw. A snow probe is useful for measuring the depth of snow bank if building a snow cave but a tent pole fixed with tape or maybe ski stick without basket works also. I am quite sceptical about the small plastic shovels of avalanche safety sets or things like the Snowclaw. Of course they are better than nothing, but they are not meant for building snow shelters. They are too small to pile and dig snow fast and might even break on really hard snow. If you can take several tools for shelter building: a big shovel is good for piling snow and extracting it from a sow cave, a small metal shovel is good for digging and saw is good for cutting blocks. Then on the other, train with the equipment you carry with you in the backcountry. That is what you will use in an emergency. If I’d had to choose only one tool for shelter building on long skiing trips in Lapland, it would be a shovel with decent size steel or aluminium scoop, a telescopic shaft and D shaped handle. It would work for piling and digging snow and could be also used to cut snow blocks. For example Voile has some very nice shovels. Snow trench is the most basic of snow shelters. You simply dig a big hole of prefered size and depth in the snow and then cover it with something. The trench can be covered for example with snow blocks or some fabric. Skis, ski stick and sleds are useful to give the cover a structure. A tent that has broken in a storm can still be used to cover a snow trench keeping you protected from the storm. The length of the structures supporting the roof somewhat limit the size of the trench. In my opinion, optimal size for a snow trench would be so that you could sit and sleep in it comfortably. For me this would mean a minimum of 220cm in length and 80 cm in width so that my sleeping bag wouldn’t brush the walls and get wet and some 90-100cm of height to able to sit. A good size for two would be about 250cm long and 150cm wide. In addition you can leave a shelf in the trench so that you sleep higher than the bottom of the trench as the cold air sinks to the bottom. When building a trench for two you can dig the middle part deeper and leave shelves on both sides. Often there is not enough snow to dig a meter deep snow trench, but you can raise the trench by piling the snow from inside to the sides. 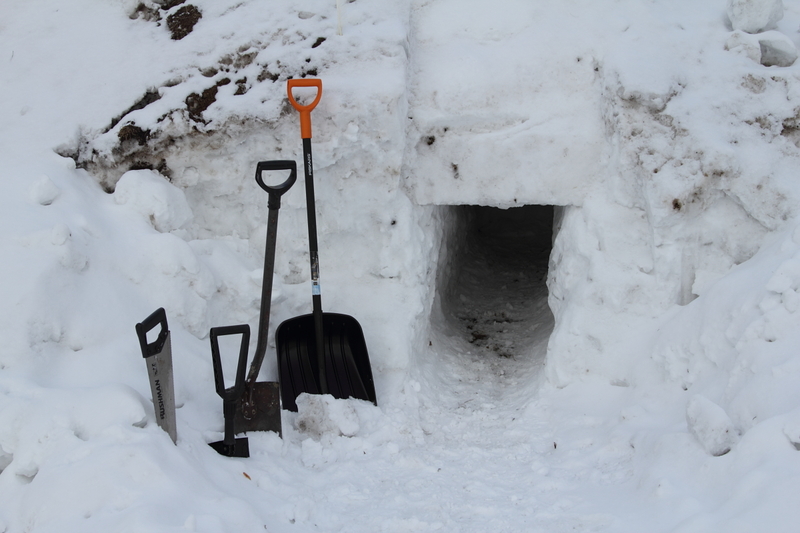 A snow trench is not likely to be as warm as a quenzee or a snow cave because the structure is not as tight nor as well insulated but it will still provide proper shelter from a storm and is quick and easy to build. Section hiker has a nice writing about snow shelters including photos about snow trenches covered with a tarp. Also Scandinavian Hiking has some pictures and experiences about tarp covered snow trenches. A largish quezee I built this February on a shore of a lake. Quenzee (or quinzee or quenzhee or what ever you like to call it) is basically a pile of snow with room covered inside of it. 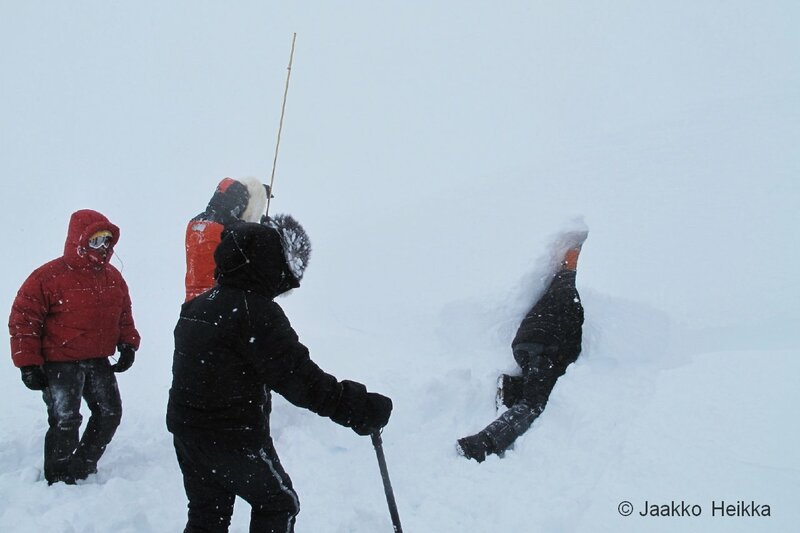 The difference between a quenzee and snow cave is that the snow cave is built to naturally formed snow bank or pile but building a quenzee also involves piling the snow for it. To get the basic idea of a quenzee you can take a look Jukka Tammisuo’s instructions – though I disagree with some parts. Quenzee might be the only working snow shelter design in the early winter or in forested areas where only powdery snow is available. Quenzees take some time to build as you have to pile the snow and let it settle before carving it but when done it provides good shelter. And if you need to build one as an emergency shelter on forested area, you can usually make a fire while waiting the snow to settle. If you can’t you have to stay warm in some other way. I have built several quinzees and will tell more about them on my next post. Digging a snow cave in strom in Sarek, March 2010. We made snow caves for six and for four people and then connected them. 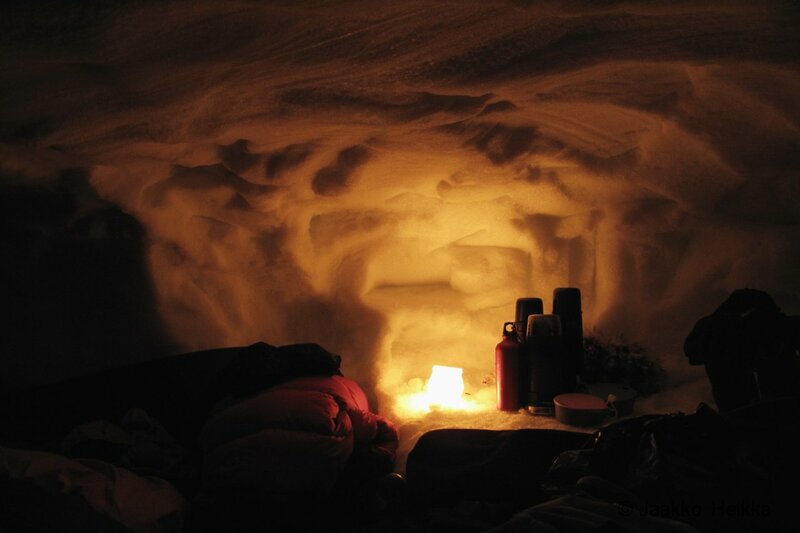 In my opinion, snow cave is the ultimate snow shelter: it is warm, comfortable, quiet and quick and easy to make. The down side is that you a lot of preferably hardened snow to build one so the areas to build a snow cave are somewhat limited. There are several different ways to make snow caves with different architectures. I know too good ways, one that works well for hardened snow banks and one for softer snow. I will describe the techniques in my next post. For training, you can carve a snow cave even in hardened banks or piles of snow built by snow blows but be sure that there wont be any machines operating on the snow pile while you working on it or sleeping in it! As I wrote earlier, I spent last Saturday night digging a snow cave. The snow was rock hard and had ice chunks up to size of a big rucksack so the digging was a bit hard. We used iron shovels usually used for digging sad and dirt and had to use an iron bar to make the ventilation hole but the result was incredibly cozy. Igloo is a dome-shaped snow shelter built from blocks of hard snow. Igloo might be the only snow shelter doable on glacier like areas were all snow is hard and wind packed. Igloo is the traditional shelter of the Inuits and can be very spacious and comfortable.I’ve been told that experienced Eskimos can build an igloo in an hour or so but if you don’t have the proper routine the building will take a lot longer. I have never built an igloo myself but maybe I’ll still find time to build one before the spring arrives. Igloos are not as warm as snow caves or quinzees because the structure is not as sealed and usually the walls are thinner. I have also been told that it is not necessary to make a ventilation hole in an igloo as there is always some ventilation between the blocks of snow. But I highly recommend the always burn a candle inside any snow shelter. There are also special tools like the Icebox that can be used to build an igloo from soft snow. I haven’t use these but I think they might be fun way to build a snow shelter but are not suitable for emergency use. They are heavy and the building takes quite long time. And I don’t think I’d bother carrying one with me when on longer winter outings. What are your experience about snow shelters? Have you some experience about using them in emergency? Maybe tips on building na igloo? Do you disagree with me about something? Please, feel free to leave a comment! And come back later to check ou the second part of the post! Kiitos vielä Cumulus-vinkistä, kuvia uudesta pussistani blogissani! Not much chance of me being able to build a snow cave here, but maybe when I visit friends in the far north?